That rule usually went unbroken for only a few levels at most. Invariably when my siblings and I played the video game Rampage on the Nintendo Entertainment System one of us would throw an inadvertent punch trying to eat some fleeing human and from there it was digital chaos, generally followed by real-world bickering or wrestling matches. 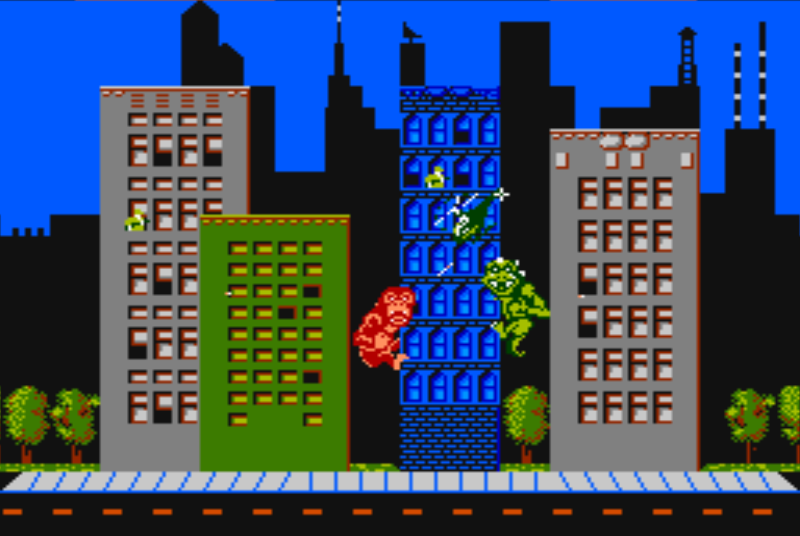 There wasn’t much to Rampage, one player “Godzilla” and the other “King Kong” (but with off-brand names of course), its gameplay consisting of smashing buildings, eating people for energy, and fighting the national guard. There were a ka-jillion levels representing American cities as you two monsters bulldozed your way across the country; each “city” looking pretty much like the last. My brother and I once decided that we would beat the game, leaving the NES on for days at a time since in that era there was no way to save our progress, and between bouts of my parents yelling at us to go outside or having to go to school, we eventually finished it. I remember the game’s ending being nowhere near worth the amount of time we spent getting there. Mostly my memories of Rampage are about it being a silly, cooperative experience where we did things like starting games of tennis by punching manhole covers at each other or racing to see who could eat incoming paratroopers first. Good clean fun. Decades later (!) I had a gift card to my local board game store burning a hole in my pocket and perusing the store’s shelves I saw the board game Rampage. Sure enough its cover art had a big Godzilla-like character smashing buildings and eating meeples (the precious term for the little wooden pieces that represent people in board games). I knew then that had I found what I hadn’t really been looking for: a dexterity-based board game. 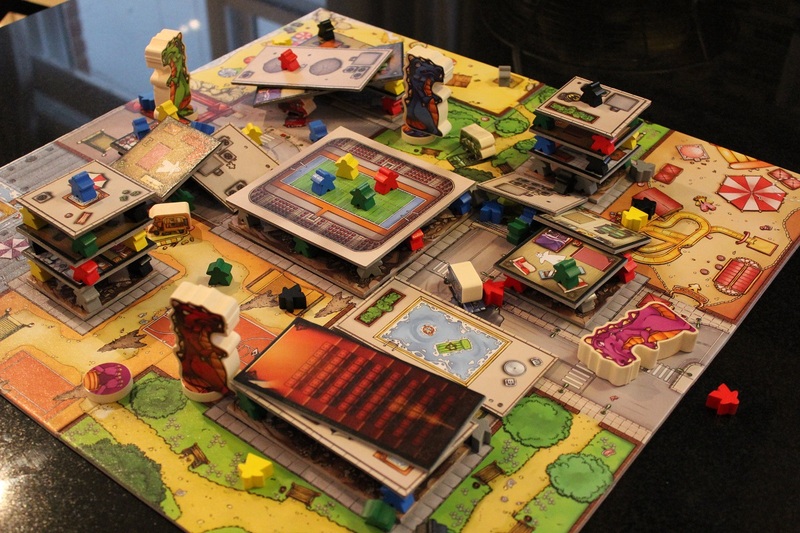 True to its source material the board game Rampage has players stomping around a city, smashing buildings, eating citizenry, and smacking each other. 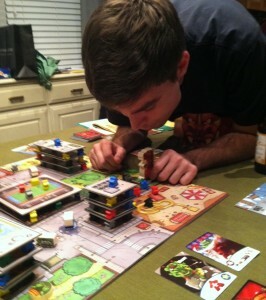 The object of the game is to eat as many people as possible, or specifically, eat full sets of meeples– sets defined as containing one meeple of every color. You can also earn points by knocking other monsters’ teeth out or by eating parts of the buildings themselves, both of which add excellent fiber to your diet. How good Rampage, the board game, actually is–my wife HATES it–is debatable. I might add, however, that my wife has actually won every game of Rampage we’ve ever played which is an indicator of just how much strategy this board game truly requires. If you ever killed time in school playing paper football or penny hockey, you may not have realized it, but you were training for this game. Many of Rampage’s actions involve carefully flicking pieces to move your monster around the board which often doesn’t go the way you’d prefer even if you’re good at such things. There is little dignity in Rampage which is why I prefer to break it out at the end of a game night when everyone is a little goofy. One of your monster’s available actions is a breath weapon which means that you have to lean down, place your chin on your actual monster piece, and blow. 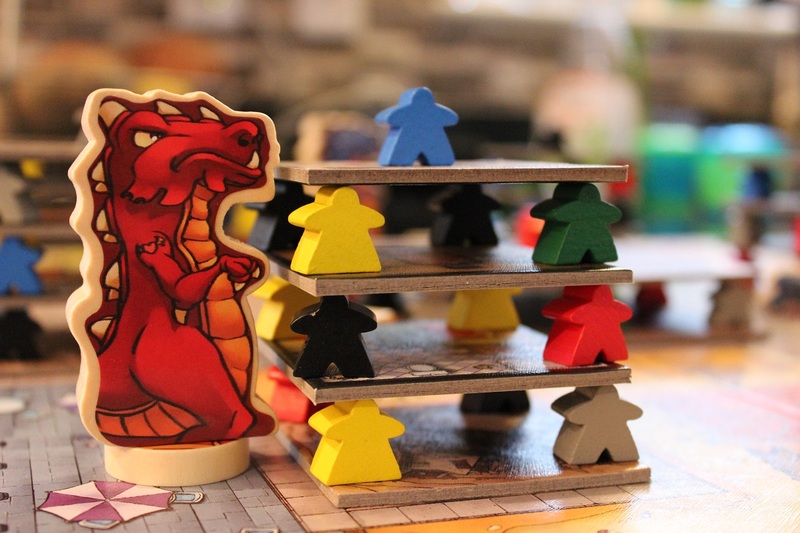 The goal being to knock meeples off their cardboard-building perches but its main effect is actually murder, since everyone else playing the game immediately dies laughing. Rampage is best played when no one is any good at it, or again in my wife’s case, players barely even want to be there. I can’t imagine playing this game with self-serious strangers or overly competitive friends. Collecting full sets of meeples is hard and much of the game falls to randomness that can easily become infuriating if you take it too seriously. If I didn’t have that gift card I’m not sure I would have gotten Rampage and now owning it I’m not sure I’d recommend anyone get it for themselves. I don’t regret the impulse purchase but the game’s hefty price tag doesn’t balance well with the light, fluffy play that it offers. That said, I like Rampage most when I can sit back with a drink in my hand, soaking up the scene of everyone roaring with laughter, while my friend impotently shakes his head after the wooden school bus he just flicked went flying off the board without hitting anything. P.S. 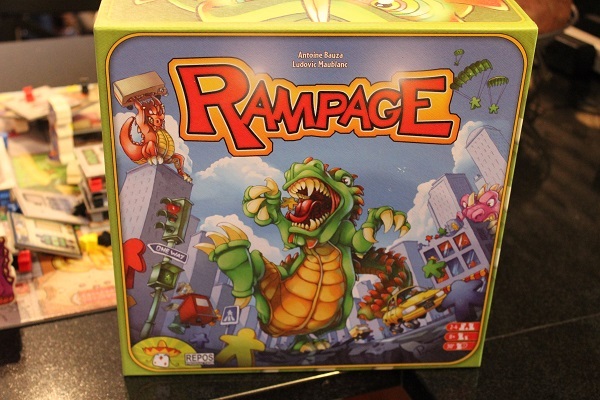 It turns out that the makers of Rampage, the board game, DIDN’T EVEN HAVE THE RIGHTS TO THE RAMPAGE NAME. Pretty gross behavior on their part and ire-inducing for me, considering that there’s a good chance I wouldn’t have even considered getting the board game if I didn’t have that bit of nostalgia for the Rampage video game. However, new prints of the game are being published under the title Terror in Meeple City, a name I reluctantly score a 10 out of 10 for being a pretty good name.